Pencaitland lies astride East Lothian's River Tyne about five miles south west of Haddington. The river divides the village into Easter Pencaitland and Wester Pencaitland and the stone bridge that was built in 1510 to connect the two parts of the village still stands today. It now carries modern traffic: albeit in a single direction at a time controlled by traffic lights in deference to its age! Castlesound Studios is housed in an old primary school and has been used over the years by bands such as Runrig, REM, Simple Minds and The Blue Nile. 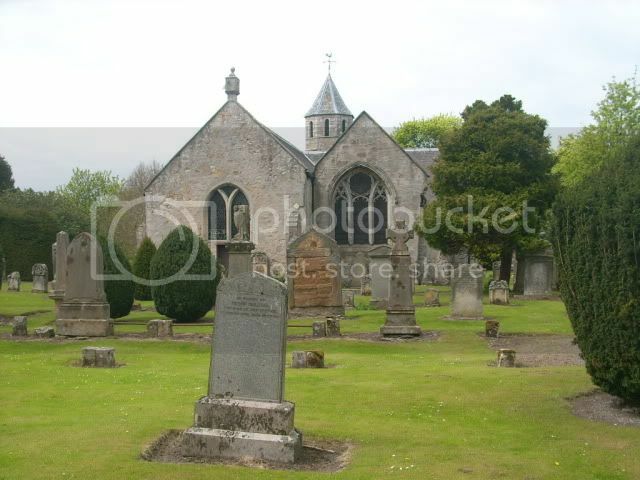 Close to the 1510 bridge and on the east side of the river is Pencaitland Parish Church. 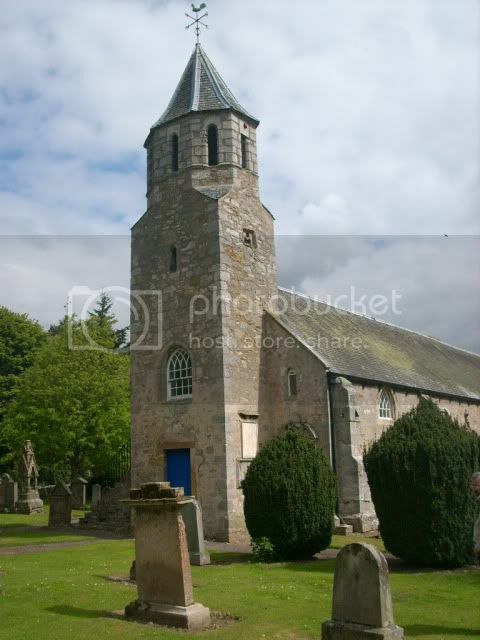 This has an unusual and attractive tower which probably served as both a belfry and a dovecot. 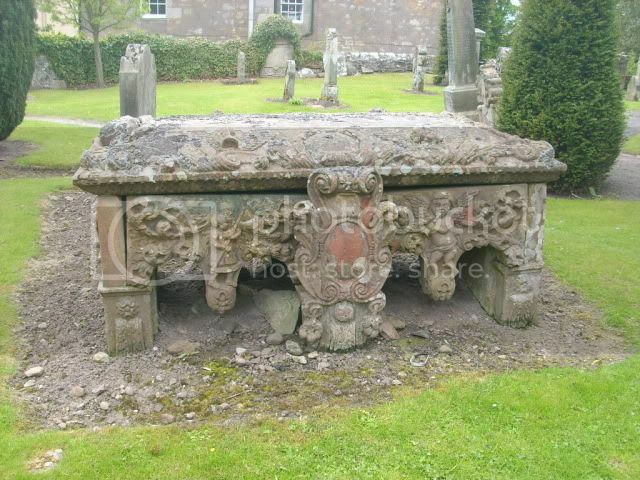 Much of the church dates back to the end of the 1500s or early 1600s, though it is thought to stand on the foundations of a much earlier church. 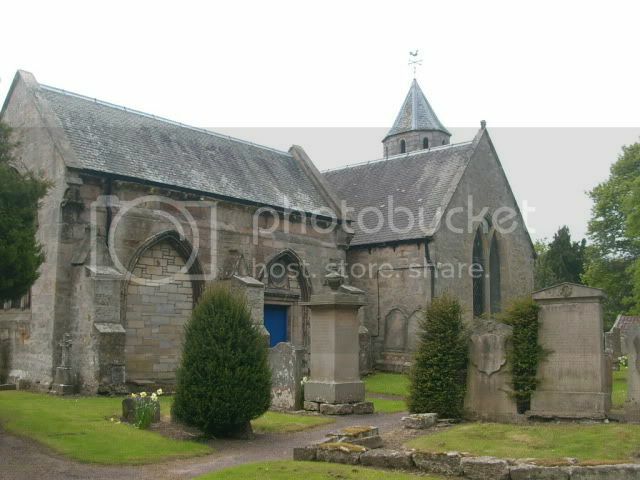 And a chapel within the church is thought by some to date back to the 1200s, though may actually be rather older. There are no CWGC stones within the churchyard, but there are a couple of military graves and many old (interesting) grave stones. 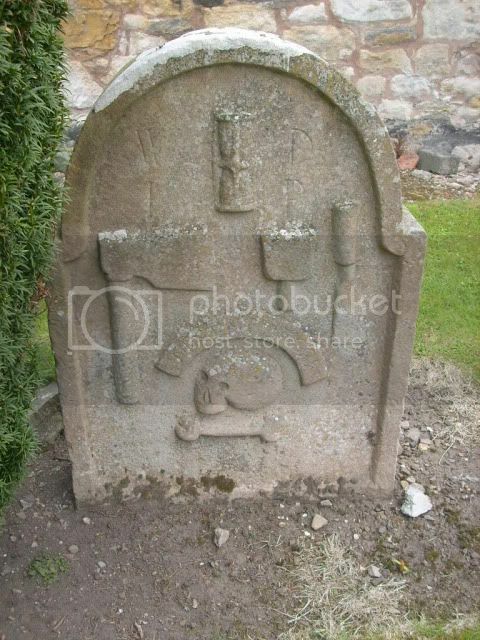 Erected to the memory of Mr Robert Richardson who died at Pencaitland Cottage on the 18th June 1838 in the 73rd year of his age. also his family. 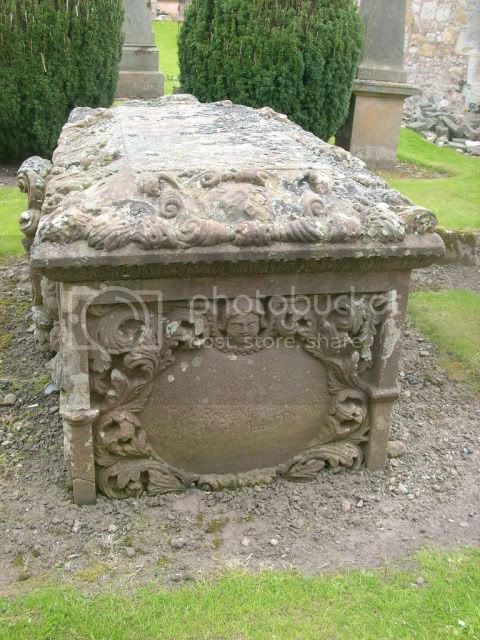 Dr Johnstone Thomson Richardson 57th Regt died at Enniskillan Ireland on the 10th Dec 1848 aged 33. 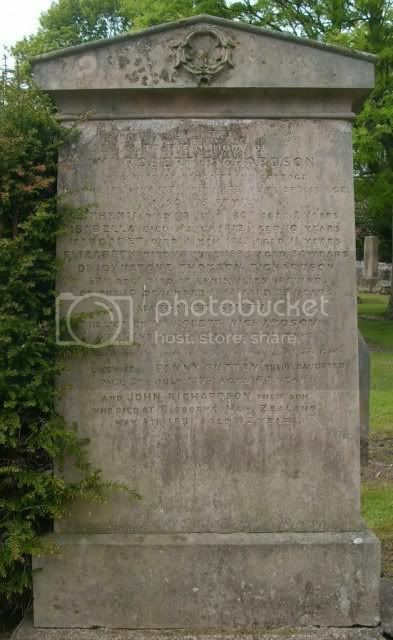 Margaret Smith relict of Mr Robert Richardson died 22nd March 1866 aged 91 like wise Fanny Sutton their daughter died 9th July 1875 aged 64 and John Richardson their son who died at Gisborne New Zealand May 8th 1891 aged 82. 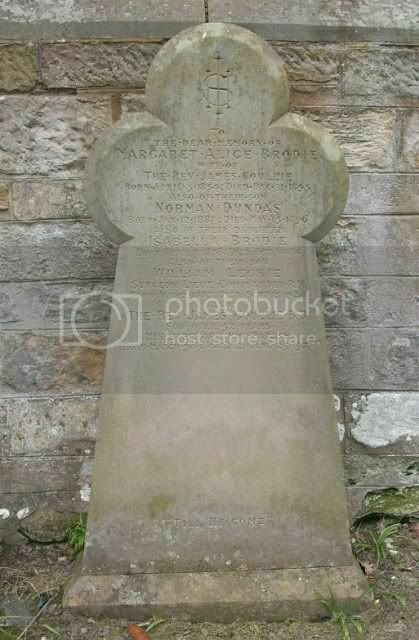 To the dear memory of Margaret Alice Brodie wife of The Rev James Coullie born April 5th 1854 died Dec 31st 1895, also of their son Norman Dundas born Jan 12th 1887 died May 15th 1896 also their daughter Isabella Brodie born April 5th 1878 died Oct 7th 1904 also their son William Leckie Surgeon Lieutenant Commander R N born Jan 12th 1887 died Sept 15th 1924 also The Rev James Coullie B.D for over 52 years Minister of this Parish born March 30th 1844 died June 25th 1927. Surgeon lieutenant Commander William Leckie Coullie RN died suddenly at Southsea on Sept 5th, aged 37. 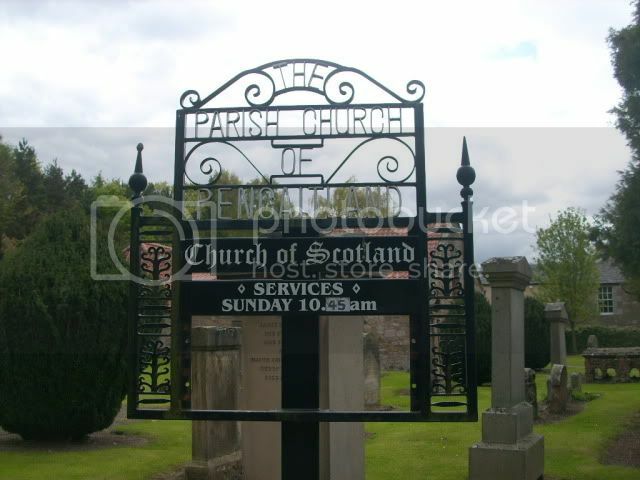 He was the youngest son of The Rev James Coullie of Pencaitland, and took the Scottish triple qualification in 1915, after which he entered the navy attaining his recent rank on April 12th 1921. He was serving on HMS Vernon at Portsmouth. HMS Vernon was a shore establishment or 'stone frigate' of the Royal Navy. Vernon was established on 26 April 1876 as the Royal Navy's Torpedo Branch and operated until 1 April 1996, when the various elements comprising the establishment were split up and moved to different commands. 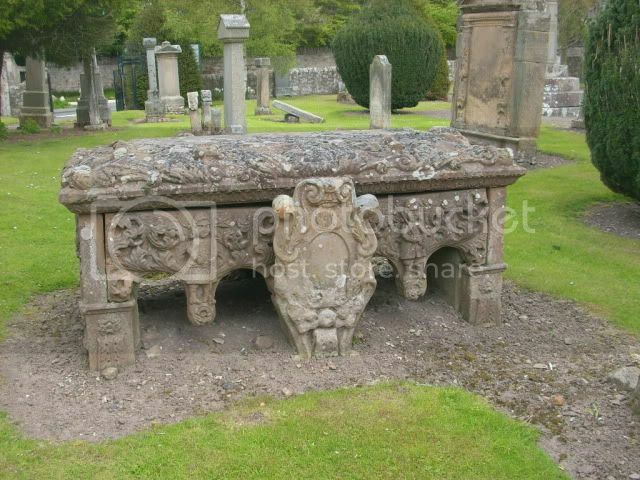 Some of the old stones found in the Churchyard.